I saw a card a couple of weeks ago by another talented Close to my Heart consultant that was the basis for this card. I loved how she used the brand new Irresistables Lots of Dots letter stickers. These things are seriously fun to play with! When you color them in (markers, sponge on ink, chalks - whatever!) the white polka dot resist on the letters pops right out. Its like a magic trick! This was the first time I tried the new ribbon ruffling technique shown in the Felicity National Papercrafting blog (going on through January) by CTMH. 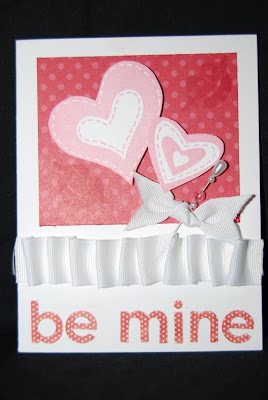 I used some Tombow Powerbond and simply applied the ribbon doing the ruffling by hand. No sewing required! I also added a little bow with one of the sweet Pretty Pins (I don't use these enough!) with the end stuck down under the other ribbon to keep little fingers safe! The hearts and the kissy lips are from our new So Lucky set - perfect for both Valentine's Day AND St. Patricks Day and its a C size so its only $18.95 - LOVE THAT!